Saturday, June 2, 2012, starting at 9 a.m.
On Saturday, June 2, 2012, between 9 a.m. and 2 p.m., the Toronto Police Service, in conjunction with Canadian Tire, will be kicking off a Bicycle Registration and Theft-Prevention Campaign at the Canadian Tire Store at 1025 Lake Shore Boulevard. Each year in Toronto, thousands of bicycles are stolen. Many of these bicycles are recovered within a short time but police are unable to identify their owners. With this campaign we will try to educate the public in theft-prevention techniques to help to stem the tide of thefts. Click here to register your bicycle. The Toronto Police Service, as well as Canadian Tire employees, will be showing theft-prevention tips, safe-riding techniques and giving people the opportunity to speak with TPS bicycle officers. Canadian Tire will have their “Spin” team giving free bike-safety adjustments. Members of the Toronto Police Service will also be inspecting car-seat installations with our car-seat personnel. 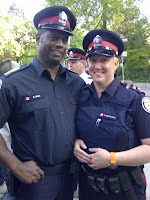 On Tuesday, May 29, 2012, between 7 a.m. and 9 a.m., at the intersection of Queen Street West/Bay Street, the Toronto Police Service will be introducing " Heads Up! Distraction Can Be Fatal." Pedestrian safety is an issue that affects all Torontonians. Walking is great exercise, and a convenient and effective way to explore our city. We are all pedestrians at some time of day. However, walking in the city of Toronto sometimes comes with a terrible cost. Each year in Toronto, many pedestrians are injured and killed on our roadways. In 2011, a total of 2,101 pedestrians were struck, 18 of them fatally. In nearly half these cases, the pedestrian was at fault – not the driver of the vehicle. Tragically, many of these collisions were avoidable. In a world where we are bombarded daily with information from electronic signage and personal communication devices, it is easy to overlook devices that are designed to keep us safe while walking: crosswalks, traffic lights, pedestrian signals, and posted signs. The Toronto Police Service is concerned about the increasing level of pedestrian distraction, and dangerous pedestrian behaviours that can result in serious injury and death. The Service would like to remind the public to exercise caution, and remain alert at all times, while walking on sidewalks and roadways and especially while crossing the street. 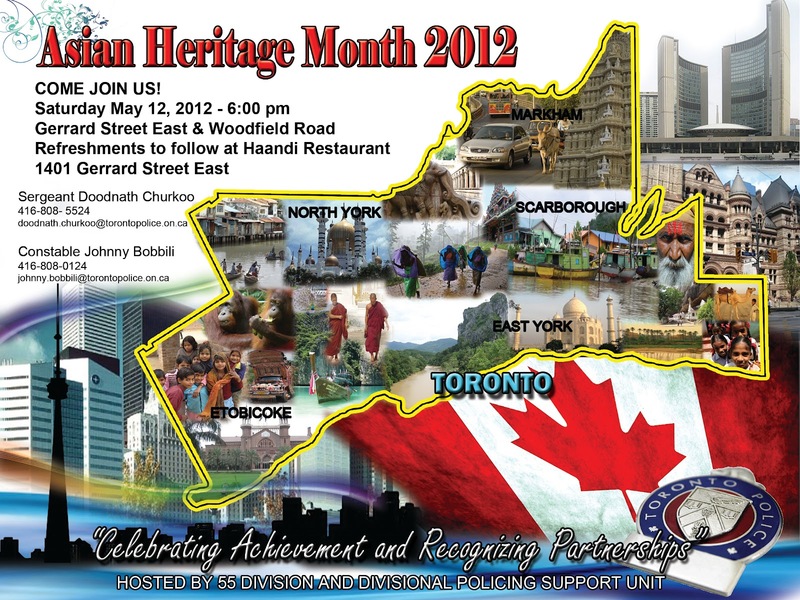 The Toronto Police Service has created a pedestrian safety awareness campaign, which will run during the month of June 2012, entitled “Heads Up! Distraction Can Be Fatal.” The campaign consists of three Public Service Announcement (PSA) videos, produced by the Toronto Police Service Video Services Unit, which will be posted on the Toronto Police Service YouTube page, as well as a social media messaging campaign throughout June. The PSA videos demonstrate various types of dangerous pedestrian behaviour, as well as corrective information provided by uniformed officers of the Toronto Police Service. raise awareness of the dangerous and often fatal consequences of risky behaviours. 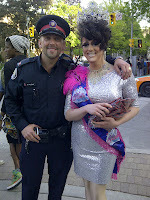 On Tuesday, May 29, 2012, Constable Clinton Stibbe of Toronto Police Traffic Services will be at the intersection of Queen Street West/Bay Street, between 7 a.m. and 9 a.m., to introduce the campaign to the media and discuss pedestrian safety. A press kit will be available at this time (including DVD and MOV versions of the three videos, suitable for embedded web−streaming, as well as JPEG still images). The kit can also be obtained through Toronto Police Service Corporate Communications, at 416−808−7100. Dr. David McKeown, Toronto's Medical Officer of Health, has issued a Heat Alert for today. The Heat Alert will be in effect until further notice. During a Heat Alert, the public is encouraged to call or visit family, friends and neighbours, especially isolated adults and seniors who are at greater risk of suffering from heat-related illness, to make sure they are cool and drinking plenty of fluids. Other groups at risk include people with chronic illnesses, limited mobility and with certain mental health illnesses, infants and young children, people on certain medications and those who are homeless. Landlords of buildings without air conditioning are encouraged to provide a dedicated cooling room for residents to escape the heat. Community agencies are encouraged to educate clients on the risks of heat-related illness and to call or check those clients at increased risk of heat-related illness during alerts. For the past 23 years Bike Month has been organized and delivered by the City of Toronto with growing participation by Toronto's many cycling and community groups. Bike Month has evolved from a 1998 Bike to Work Day event to become the largest event of its kind in Canada. As the city expanded through amalgamation, so did the event’s scope and focus. Last year 50 groups including various businesses, community groups, organizations and individuals, hosted over 100 bike events. We’re excited to announce that over the next three years Bike Month will transition from a City of Toronto program to a community-based program led by Cycle Toronto (formerly the Toronto Cyclists Union). Starting May 28th, join us for an incredible suite of Bike Month events happening across Toronto! Featuring more than 100 events across the city that promote all aspects of cycling, Bike Month 2012 offers something for everyone. From rides and festivals, to free guided tours by bike, to art shows and film screenings, Bike Month 2012 is a great way to celebrate cycling in Toronto. For a full list of events, please visit the Bike Month Calendar on our website. If you can’t make many events or are having trouble choosing, below are six great events happening in June that you won’t want to miss! And don’t forget to take theBike to Work Day pledge, brought to you by SmartCommute! We hope to see you at a Bike Month event soon! More information about these activities and other Bike Month features is available at http://www.toronto.ca/cycling/bikemonth and by phone at 311. Bike Month is presented by the City of Toronto and the Toronto Cyclist Union. Bike Month is sponsored by Sweet Pete’s Bicycle Shop, Live Green Toronto, BIXI Toronto, St. Lawrence Market, Jet Fuel Coffee, ZM Cycle and Fitness, Urbane Cyclist, CyclePath Toronto and Hoopdriver Bicycles. The television sponsor for the event is CP24 and Now Magazine is the print sponsor. Bicycles are legally considered "vehicles" on Toronto's roadways. That means cyclists must obey the rules of the road as any other driver and should be treated as equal users by all other vehicles. The best way to avoid collisions is to be prepared and be aware of other vehicles around you. Avoid common cyclist errors and common motorist errors committed around cyclists. Obey traffic signs and signals. Bicycles must follow the rules of the road like other vehicles. Never ride against traffic. Motorists aren't looking for cyclists riding on the wrong side of the road. Provincial law and common sense require that cyclists drive like other vehicles. Follow lane markings. Don't turn left from the right lane. Don't ride straight through a lane marked "right turn only." Avoid passing on the right. Motorists may not look for or see a bicycle passing on the right. Scan the road behind you. Learn to look back over your shoulder without losing your balance or swerving. Keep both hands ready to brake/turn. You may not stop in time if you brake one handed. Allow extra distance for stopping in the rain, since brakes are less efficient when wet. Turns are not always planned events so having your hands ready to respond is paramount. Wear a helmet and never ride with headphones. Dress for the weather. In rain, wear a poncho or waterproof suit. Dress in layers so you can adjust to temperature changes. Use hand signals. Hand signals tell motorists and pedestrians what you intend to do. Signal as a matter of law, of courtesy and of self−protection. Choose the best way to turn left. There are two choices: (1) Like an auto: signal to move into the left turn lane and then turn left. (2) Like a pedestrian: Walk your bike across. Make eye contact with drivers. Assume that other drivers don't see you until you are sure that they do. Look out for road hazards. Watch out for parallel−slat sewer grates, gravel, sand or debris. Use lights at night. The law requires a white headlight and a rear reflector or taillight. Keep your bike in good repair. Adjust your bike to fit you and keep it working properly. Check brakes and tires regularly. Routine maintenance is simple and you can learn to do it yourself. Reflective tape is also required both front and rear. Far too many pedestrians, particularly senior citizens, are victims of vehicular accidents on our roadways. To promote safety on city streets, 33 Division launched its “Be Seen Be Safe” safety armband project at its second annual Safety Expo on May 15 at Fenside Public School. The expo allowed the public to look into a variety of options and products to keep them and their homes safe. The lime-green reflective armbands will make it easier for pedestrians to be seen at night. “Every year, we lose a number of senior citizens and other pedestrians to motor vehicle collisions. The loss of life is tragic,” said Insp. Richard Hegedus. Hegedus said Toronto Fire Services, Emergency Medical Services and the Amalgamated Transit Workers Union that represents Toronto Transit Commission (TTC) workers, have endorsed the project. “This is recognition that far too many of our senior citizens have been victimized when they are pedestrians on our roadways,” said 33 Division S/Insp. Tony Riviere. Area resident Len Helwig, who was the victim of a pedestrian motor vehicle collision, promised to use two of the reflectors when he is out on the street. In addition to the one around his arm, he wrapped one around his walking stick that he now uses, after jumping out of the way of a turning vehicle. He tore ligaments in his left knee and damaged his right leg. Riviere acknowledged Community Police Liaison Committee (CPLC) member Roz Sonshine for championing the armband project. “She has been the lead on this and she has done an absolutely fantastic job,” Riviere said. He also acknowledged the armband sponsors, including Delmanor Wynford, Cadillac Fairview Corporation and Premier Homecare Services. They were each presented with a framed certificate. Nearly 40 vendors attended the expo. “We do crime prevention all the time, but we wanted to do something different,” said Const. Kelly Downie. David Reiff and Tom Reimer of Metalex Screen Doors were proud to be part of the expo attended by community members and MPP Michael Coteau. The Scarborough company produces garden and folding gates, window-well covers, Juliette balcony railings, door grills and TeleDoor bells. “What is unique about us is that we are in the business of providing physical security,” Reiff said. Pedestrian deaths on our roadways have represented a greater percentage of all traffic fatalities over the last few years. To ensure pedestrian safety, police would like to remind the public of their responsibilities crossing the roadways. To lawfully cross a signalized intersection with pedestrian controls, you may only enter the roadway when the walk signal is illuminated for your direction of travel. It is illegal to enter the roadway if the “do not walk signal” is flashing or is solid. When there are no pedestrian controls, you may only enter the roadway on a solid green signal for your direction of travel. Where there are painted lines on the roadway indicating either a pedestrian crosswalk or pedestrian crossover, you must cross within those lines. It is illegal to cross a street mid block and interfere with traffic. − cross on a fresh signal and watch out for vehicles turning across your path. Pedestrians have the same responsibility as motorists to follow the rules of the road and not compromise their safety or that of any road users. No matter who has the right of way, pedestrians should always be prepared to stop, look and listen for other traffic to avoid a collision. That was just one of the helpful messages provided by Sergeant Hayles who led the Safety Walk in Cabbagetown. Approximately 30 people accompanied Sergeant Hayles, PC Huntley, PC Cummings, PC Robertson and TCH security through the side streets nearby the Dan Harrison TCH complex. Residents were encouraged to take this opportunity to voice concerns about problem areas, personal security and how to receive assistance when needed. Take Action: residents of Dan Harrison were encouraged to call TCH security who will in turn escalate to 51 Division if needed. Anyone may also call the non emergency line at 51 Division at 416-808-2222. Always call 911 for emergencies. Sergeant Hayles was impressed with the turnout. 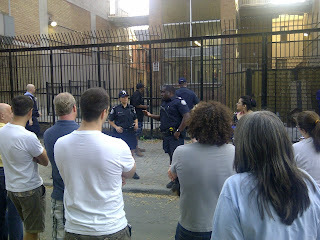 CPLC members, at least four residents' associations (including Cabbagetown South Residents Association, Garden District Residents Association, Dan Harrison Complex TCH Residents Group and Corktown Residents and Business Association) and many other area residents were in attendance displaying strength and care in the communities and neighbourhoods alongside the dedicated officers of 51 Division. 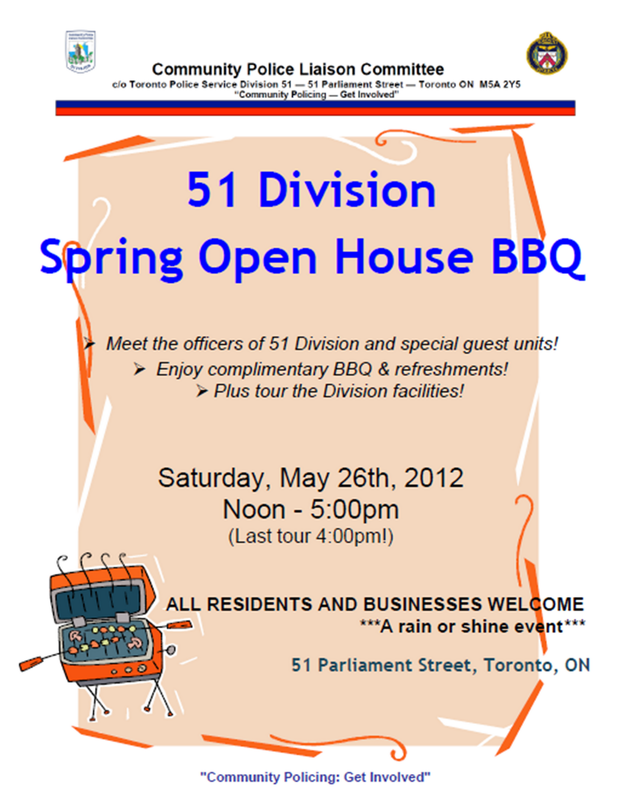 Don't forget, the 51 Division Spring Open House BBQ is this Saturday! 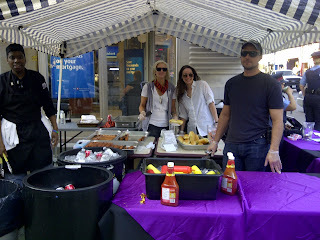 Why: Free Hot Dogs, drinks, tours of the facilities with the officers!!! The Toronto Police Service joined police across the country to support “Canada Road Safety Week,” from Monday, May 14, 2012, to Monday, May 21, 2012. Canada Road Safety Week is a national traffic safety and enforcement initiative, conducted in partnership with the Canadian Association of Chiefs of Police, police services from across Canada and Transport Canada. This co-ordinated effort between policing agencies aims to achieve the goal of making Canada’s roads the safest in the world. Police were asked to pay particular attention to the four leading causes of collisions and injuries related to collisions during the one-week campaign. A total of 14,656 charges were laid throughout the campaign by officers, as well as an additional 1,123 parking related offences. 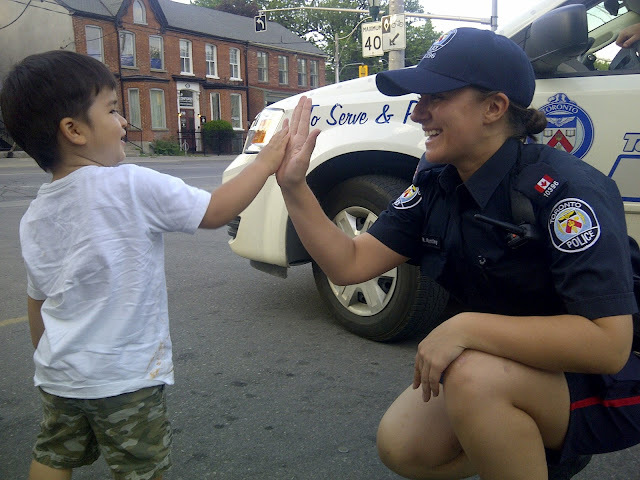 Traffic Services is dedicated to ensuring the safe and orderly movement of traffic within the City of Toronto. Stay informed with what’s happening at: Twitter, Facebook Fan Page, Facebook Group and on Blog. Texting -- It can wait! Emergency Medical Services Week is celebrated in Toronto and across Canada. This year's theme is "EMS: More than a job . . . a calling!" The following five events are opportunities for Torontonians to meet the men and women who serve the city as paramedics and emergency medical dispatchers - and to find out more about what they do. Media are invited to attend these events. Interviews and photo opportunities will be arranged. Date: Tuesday, May 22, 10 a.m. - 2 p.m. Location: Toronto City Hall, 100 Queen St. W.
Members of the public are invited to meet paramedics and emergency medical dispatchers, have their blood pressure checked, try cardiopulmonary resuscitation (CPR) and try using an automatic external defibrillator (AED). Tours of an operational ambulance and a vintage ambulance will be offered. Date: Wednesday, May 23, 10:30 - 11:55 a.m. Opening remarks at 10:30 a.m.
Seventy-five Grade 7 students will receive hands-on CPR training with mannequins after watching an instructional video on how to recognize the need for CPR and how to use 9-1-1 for emergency calls. After the lesson, students will tour an ambulance and meet the EMS mascot, PG Bear. Date: Thursday, May 24, 10 a.m. - 2 p.m.
Toronto EMS invites the local community and other Greater Toronto Area EMS services to donate blood. Call 1-888-2Donate to make an appointment. Date: Thursday, May 24, 7 - 8 p.m. Residents, allied services (police and fire), paramedics and emergency medical dispatchers will be recognized for outstanding contributions to the community. Date: Friday, May 25, 10 a.m. - 2 p.m. Location: Toronto Eaton Centre, Foyer, 220 Yonge St.
Members of the public will be able to meet paramedics and emergency medical dispatchers, have their blood pressure checked, try cardiopulmonary resuscitation (CPR), and try using an automatic external defibrillator (AED). Tours of an operational ambulance and a vintage ambulance will be available. Toronto police officers joined community members in celebrating the International Day Against Homophobia and Transphobia (IDAHO) on Church Street. This year, the Chief’s LGBT Community Consultative Committee (CCC), co-chaired by Christopher Hudspeth, of the Church-Wellesley Village Business Improvement Association, celebrated IDAHO with a big street barbecue. The event is the product of a strong relationship between the police and LGBT community. This event also resulted in money being raised to assist youth in the community who are working on positive social justice issues. 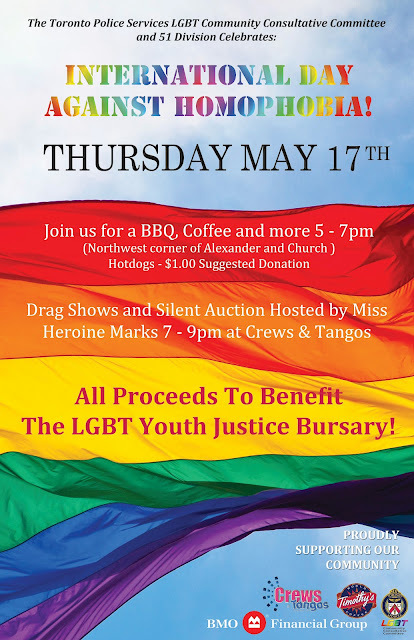 Sponsored by representatives from the local business community, the LGBT CCC hosted over 400 people, providing hot dogs, soft drinks, along with tea and coffee. 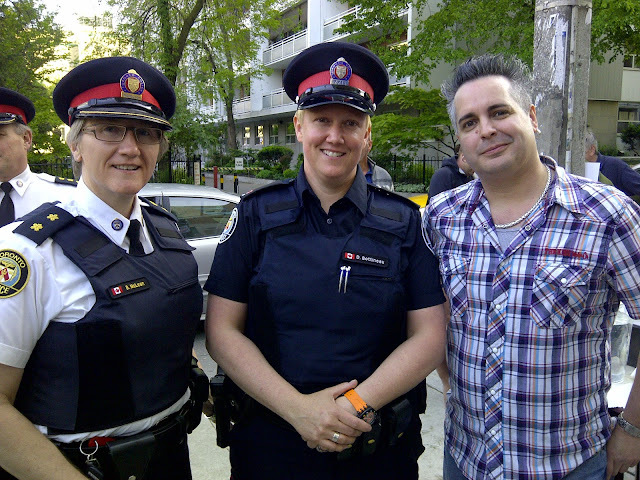 Hudspeth was joined by officers from 51 Division and the Service’s LGBT Internal Support Network, in engaging the community in lively conversations. On October 29, 2010, an investigation began regarding a male suspect who was trafficking in crack cocaine. The suspect was contacted by phone and engaged in a drug‐related conversation, during which he agreed to sell crack cocaine for an agreed price at a given location. Constable Mike O’Connor was undercover and attended the location, where he was met by the suspect and his partner. Both suspects got into the officer’s vehicle and engaged the officer in a drug‐related conversation. The suspects then refused to complete the transaction, left the vehicle, and began to flee on foot. Sergeant Robert Davies and Constables Paul Korac, Brent Johnston and Jason Hillier identified themselves as police officers and advised the suspects they were under arrest for trafficking in cocaine. One of the suspects immediately fled on foot from the building and Constables Korac and Hillier gave chase. Sergeant Davies and Constable Johnston took physical control of the first suspect, but a violent struggle ensued. The suspect struck Sergeant Davies in the face and the upper body area to try to break free. During the struggle, the suspect produced a firearm from his waistband and pointed it at the officers. The officers continued to struggle with the suspect. The suspect was able to break free of the officer’s grasp and flee, still holding the firearm. Detective Irish joined in and followed the suspect on foot into a nearby schoolyard. The suspect then discarded his firearm and a quantity of crack cocaine onto the ground. He was later apprehended and taken into custody. The second suspect was also seen brandishing a firearm and pointed it at a citizen who was jogging in the schoolyard. Constable Korac chased after the suspect and saw him throw his firearm into the bushes. After a brief struggle, Constable Korac gained control of the suspect and placed him under arrest. In recognition of their brave actions and dedication to duty, Sergeant Robert Davies, Detective David Irish And Constables Jason Hillier, Paul Korac, Brent Johnston and Mike O”Connor have been selected as Police Officers Of The Month for October 2011. 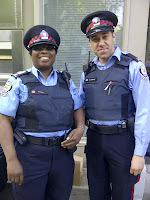 On Monday, May 14, 2012, the Toronto Police Service Toronto Anti-Violence Intervention Strategy (TAVIS) launched the "Helmets for Helpers" Campaign in the City of Toronto that will continue for the duration of the summer. The TAVIS Rapid Response Team Officers will be out looking for community members of all ages that are making positive contributions within the community, and bike helmets will be awarded to them, on the spot, in recognition of their good deeds. Five Helmets will be given away each day. For more information, please contact Staff Sergeant Ronald Khan, of the Divisional Policing Support Unit at 416-808-0106, Ronald.Khan@torontopolice.on.ca or Staff Sergeant Ronald Reed, TAVIS at 416-808-0144, Ronald.Reed@torontopolice.on.ca. Kickoff to Police Week, "Leading the way to a safer tomorrow"
Media advisory, Monday, May 14, 2012, 9:30 a.m., Headquarters, lobby, Kickoff to Police Week, "Leading the way to a safer tomorrow"
The 2012 Police Week Kickoff will be held on Monday, May 14, 2012, 9:30 a.m., in the main lobby of Toronto Police Headquarters, 40 College Street. This year’s theme is “Leading the way to a safer tomorrow.” Since 1970, Police Week has been observed in May, coinciding with Peace Officers Memorial Day, recognized internationally on May 15. Our keynote speaker for this year’s event will be L’Honorable Madeleine Meilleur, Ministry of Community Safety and Correctional Services. For further information about this event, please contact Constable Isabelle Cotton at 416-808-0135 or by email at Isabelle.Cotton@torontopolice.on.ca. Asian Heritage Month, duly recognized in 2002 by the Government of Canada, offers the opportunity to celebrate the contributions that Asian Canadians have made towards the growth and prosperity of Canada. Since then, communities across the country have been organizing annual festivities to recognize this important part of our Canadian heritage. This year’s theme “Celebrating Achievement and Recognizing Partnerships”, will allow the opportunity to appreciate the contributions made by all Asian communities and in addition the chance to highlight South Asian Canadians. Immediately following the event at approximately 7:00 p.m., an informal reception with refreshments will be held at ‘Haandi Restaurant’ located at 1401 Gerrard Street East, Toronto. For further information on this event and to confirm your attendance, please contact Victoria Shaw, Divisional Policing Support Unit directly at 416-808-0119, or via email victoria.shaw@torontopolice.on.ca. The Toronto Police Service is launching its fifth of 12 PSA campaign videos promoting the proper use of the 9−1−1 emergency system. This month's focus is on calling 9−1−1 to report suspected impaired drivers. The only call your mom should receive this Mother's Day is from you. Impaired driving is the #1 cause of criminal death in Canada, yet every impaired driving crash is preventable. By calling 9−1−1 and reporting suspected impaired drivers to police, all Canadians can play a role in keeping our roads safe and reducing impaired driving crashes, deaths and injuries. This message is delivered by MADD Canada and supported by the Ontario Associations of Chiefs of Police. In 2011, over 5,200 calls were made to 9−1−1 to report a suspected impaired driver, and over 4,200 people have been charged with Criminal Code driving offences, which include Driving While Impaired and Over 80mg, in 2011. This year so far, there have been over 1,400 calls placed to 9−1−1 to report suspected impaired drivers. "Using 9−1−1 is an effective way to report emergency situations to police. Impaired drivers pose a significant risk to public safety and certainly are emergencies. Do not put yourself in danger; call 9−1−1 and provide the information to our call−takers. Everyone can assist in keeping our roads safe and in reducing impaired driving collisions, injuries and deaths," said Superintendent Elizabeth Byrnes, Unit Commander of Communications Services. 3. "What makes you think the driver is impaired?" 4. "Are you Following the Vehicle?" The call−taker will advise any caller who is following an impaired driver to stop following the vehicle. The Toronto Police Service does NOT encourage citizens to follow or pursue vehicles or persons under any circumstance. "Every member of society should do their part to ensure that no one they know drives while impaired or gets into a vehicle with an impaired driver. By simply calling 9−1−1 to make a report, we all make our roadways safer for everyone", said TPS Staff Superintendent Jane Wilcox of Specialized Operations. Click here for related TPS article. "Impaired driving crashes can’t be taken back, that’s why prevention and intervention are essential. Ontario has significant consequences for impaired drivers but if that won’t deter them, Operation Lookout is a great program to get these drivers off the road before they crash" said Mary Purnell, Arrive Alive Board Member. A Toronto police canoe team is taking on Lake Ontario, as a tribute to the struggle of victims of crime and to help fund the program that provides support for those victims. The team will be paddling from Niagara-on-the-Lake to Sunnyside Beach in Toronto, July 21, with a goal to raise $10,000 for Victim Services Toronto. The non-profit organization partners with the police to provide immediate on-site crisis counselling and referral services for victims of domestic abuse and other crimes and to those who have lost a loved one. “Now it’s time for us to lend our support to these vital programs and services. It’s time to give back and do our part,” said Make Waves For Victims team member Insp. Joanna Beaven. The team is comprised of S/Insp. Heinz Kuck, Insp. Beaven, S/Sgt Peter Henry and Consts. Joel Landry, Jason Ngo, Marc Kalteis, John Bayes, Jazen Brautigam – all of 53 Division. Victim Services Toronto is represented by Tracey Finlay and the team is anchored by former Canadian National Dragon Boat Team champion Peter Buday. They expect to make the 51.5-kilometre journey in under five hours – a new record – by relaying team members every 45 minutes. S/Insp. Heinz Kuck, who leads the team, said the team is united behind the cause because of the strength and courage of the victims they have seen as police officers and Victim Services staff. “Emotional and physical pain is part of the human experience,” Kuck said. Kuck said Victim Services Toronto gives people a place to turn to seek out accessible services and programs that offer respite from their circumstances. “Sudden trauma or tragedy can be devastating. When these victims have nowhere else to turn, who provides accessible services and programs? Who offers a respite in the storm of physical and/or emotional trauma? Who offers support borne of raw experience and tempered by disciplined training? Victim Services Toronto relies heavily on donations to provide assistance to 20,000 people each year. The team is now training to be ready for their crossing, with the help of Outrigger Performance Advantage owner Peter Buday, a champion in sprint kayaking and dragon boat racing. Kuck said the team will be spreading the word about the crossing through visits to schools, malls and community centers, to engage in indoor paddle machine races with the community. They will also be fundraising through community BBQs, car washes, and youth sporting events. He said that, beyond fundraising, he hopes to make Victim Services Toronto a household name because of the dedicated efforts of all their staff. Help Fill the Food Banks just by watching this video and sharing it on Facebook and Twitter. For every YouTube view, before May 11, 2012, Shaw will donate $1 to the food bank drive and Campbell Canada will donate 1 pound of food up to $250,000 and 250,000 pounds of food respectively. To expand the opportunities for community input, the Toronto Police Service has included online polling on its website. Questions will be posted on various policing issues and the results published at the end of the period. Results from previous polls are also available. A new poll began on Tuesday, May 1, 2012. The survey asks about cycling in the City of Toronto – what safety precautions you take when cycling and obeying the rules of the road. The TPS is encouraging the people of Toronto to visit the "Have Your Say" section on the TPS website, and provide the Service with their opinions. The TPS Traffic Services Traffic Safety Programmes Unit would like to remind and assist the public through its "S.T.E.P. U.P." (Safety Tips for Educating Pedestrians in an Urban Population) safety program, about the proper use of pedestrian countdown traffic signals. The countdown traffic timer provides a numeric countdown display that indicates the number of seconds remaining for a pedestrian to complete the crossing. The timer starts counting at the beginning of the pedestrian flashing "Don't Walk" display, and finishes counting (i.e. a "zero" display is shown) at the end of the pedestrian flashing "Don't Walk" display. There is no countdown display during the pedestrian "Walk" or solid "Don't Walk" displays. The Ontario Highway Traffic Act 144(27) stipulates that no pedestrian approaching pedestrian control signals and facing a solid or flashing "Don't Walk" indication shall enter the roadway. Pedestrians should use the flashing helping hand and countdown timer as an indicator to complete their crossing, or go to the nearest island or median if available, and wait for the next walking person display. Countdown timers are designed to provide supplemental information to pedestrians to aid in crossing during the "flashing Don't Walk" indication. They are not designed to provide motorists with information related to the amount of green time remaining or to address vehicular red−light−running violations. The installation of these devices is to provide pedestrians with more information to assist them with a safer passage across the street. The "S.T.E.P. U.P." pedestrian safety program has been designed by the Toronto Police Service to promote cooperative safety strategies with members of our communities, using awareness, education and enforcement strategies to heighten public awareness of pedestrian safety. One of the best ways to keep our streets safe is for everyone to be courteous and cautious at all times. If the streets are safer for pedestrians, they are safer for all other road−users as well. We all need to continue to be vigilant in our safety efforts. We ask those who drive to take extra care on the roads and in parking lots, or any location that they may encounter pedestrians, especially in areas where children and seniors might be present. All motorists, transit−users, cyclists and pedestrians are reminded that road safety is everyone’s responsibility, obey all traffic laws and be diligent when using our streets. To learn more about the City of Toronto’s Transportation Services Programs that aim to reduce pedestrian injury and death through education and awareness, click here.